"This is Sugar. She is a Chiweenie. We adopted her from a woman who posted her photo via Facebook. I showed her photo to my wife and said here is a dog with a lot of love to give. She agreed, so we contacted the woman who posted her ad and said we would like to adopt Sugar. I took my grandson Triston with me and we picked her up. At first she was scared and intimidated due to people taking her and returning her because she couldn't provide them protection. I thought any reasonable human could look at her and know that the situation is just the complete opposite with small dogs. Anyway the first 4 days she stayed in our bedroom on our bed never moving. We became concerned for her health so my wife used a syringe filled with water and got her to drink. Eventually she started to eat what we put in her bowl and with lots and lots of love and attention she came out of her shell. Since it's just me and my wife at home Sugar gets 24 hour attention. Now she is pretty much spoiled and expects attention from the minute I get home from work till bed. We give it to her. She has brought so much happiness into our lives. It's incredible." 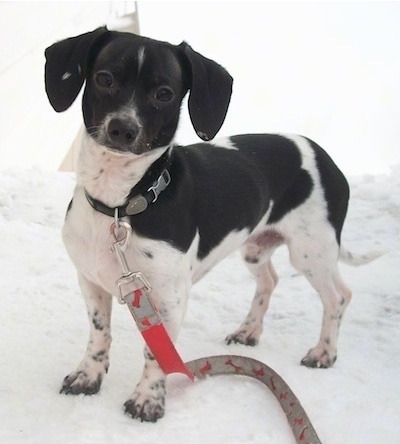 Duke the Dachshund / Chihuahua mix (Chiweenie) at 3 years old—"Duke is a 3 year old rescue Chiweenie. He’s very smart and has a loving temperament. Loves to run and play and is very social with other dogs. They make excellent dogs if you have a small apartment but they also love big yards to run wild in. 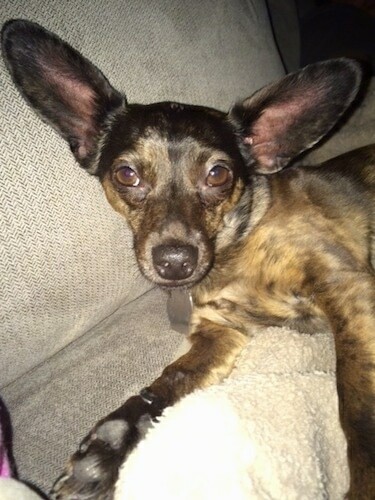 Hes a mix of a dapple Dachshund reflected by his unique markings but has the obvious Chihuahua large pointy ears." 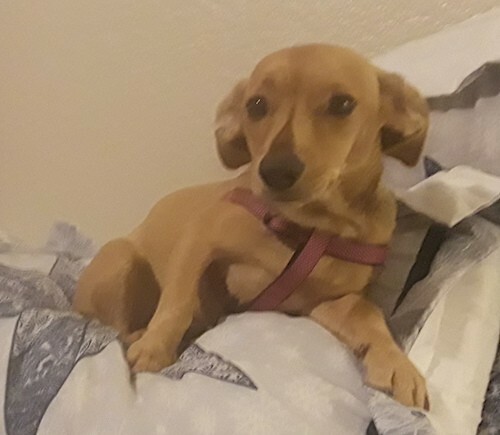 Daphnee, a 3½-year-old Miniature Dachshund / Chihuahua mix (Chiweenie)—"Her mother was the Dachshund and dad the Chihuahua." 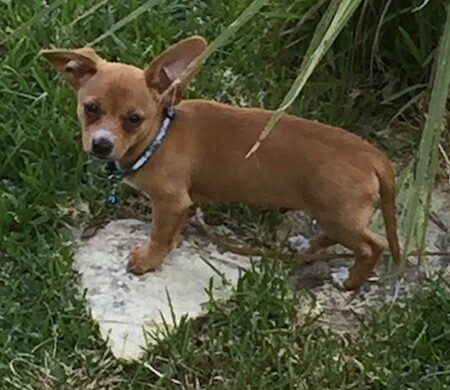 Frankie the Chiweenie at 4 years old—"He's just one big eared baby!" 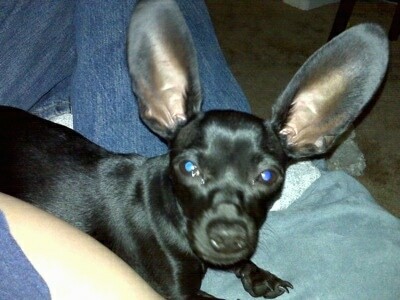 Frankie the Chiweenie at 4 years old—"My big eared baby!" 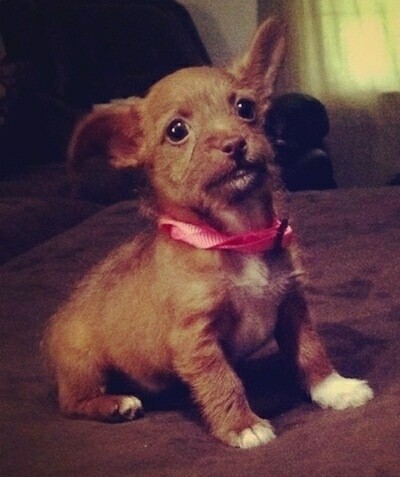 Charlie the Chiweenie puppy at 12 weeks old—"Charlie is so loving and beautiful. We are still learning all about him. And we are still trying hard to toilet train him. 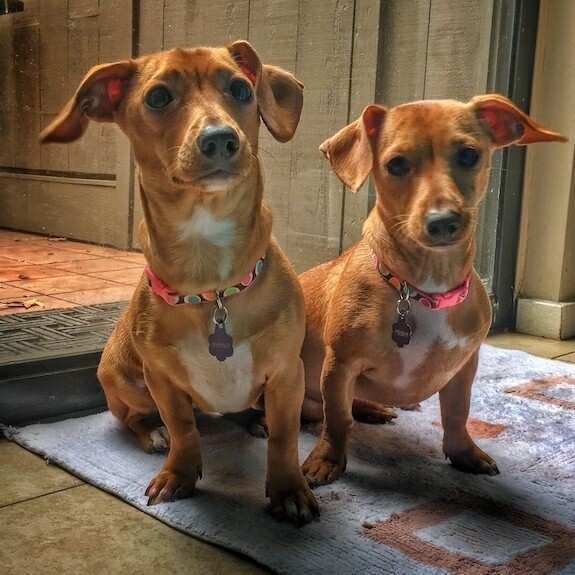 Arrghhh"
Frida & Kahlo the Chiweenies at 10 months old—"Frida and Kahlo are 2 female sisters’ 50% Chihuahua and 50% Dachshund. Their mother is a pear-head black predominant tri-colored Chihuahua and their father a red color smooth coat Miniature Dachshund. They already reached adult size, 16 inches in body length, 12 inches in their chest and 10 inches in their neck weighing 9 pounds each. We plan to control their food to keep them lean, so they don't suffer of back problems. They are a delightful pair of lap dogs! But they also love long walks, hikes, outdoors and travel by car. They are hard to train because they are stubborn, but very smart and with patience and treats, they learn rules just fine. Amazingly loving and playful dogs. 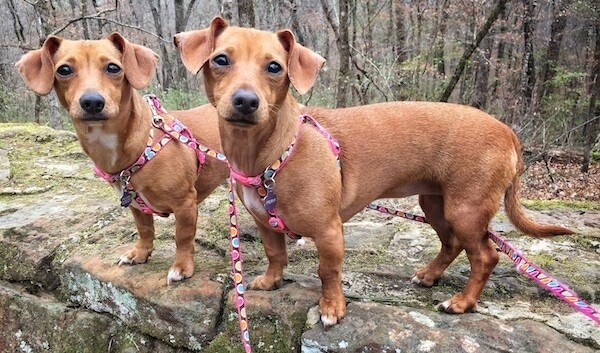 They learned to walk without a leash after walking them for 10 months in a short 5 feet leash. Hunting instincts are very prominent. They bark, but they are not at all aggressive or shown any sign of aggressive behavior. Nails need to be trimmed or filed quite often because they are indoor dogs and long nails can damage the shape of their legs. I love this mix!" The Evil Dr Porkchops the Chiweenie (long hair Chihuahua / Dachshund mix) as a puppy at 10 weeks old—"Meet The Evil Dr Porkchops. It's a great name for her because #1 we love Toy Story and #2 she is super sweet and the farthest thing from evil. She was given to us because the litter was a surprise pregnancy and they didn't want all the puppies. She is so sweet! She has fallen in love with our Pit Bull. Our Pit did not have a litter and is mothering Dr Chops. They are very entertaining and good with each other. House training has been easy because we have two other dogs so we take her out every time they go. It has worked out better than expected. We don't get the channel Dog Whisperer is on. I have heard his techniques work. I need him to help me with my Doberman. He's an 75 pound baby and he's scared of Dr Chops if you can imagine. Thanks for this page. It's been very helpful!" 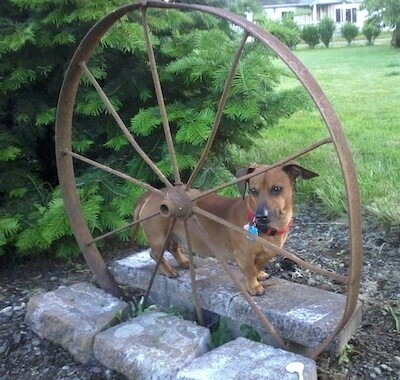 "This is my Chiweenie Buster. He is about 8 months old here. His ears are always up and he is very aware of everything that is going on unless he is tired then both his ears flop over and his eyes get droopy. He has such a great personality, he grew up coming to work with me and he has all my co-workers wrapped; he goes to one for food, another for a belly rub and another for cuddles. When he gets a new toy or a treat he has to walk to each desk showing it off! He loves kids, when we are out for walks he has to go get pets from them all. When he was young I would take his treats away from him or put my hands around his mouth while he was eating, so that when there is a child around and they do that he would not bite them, and that worked when my friend’s 2-year-old is grabbing things from him. He just sits and waits for her to lose interest then he picks it up again. I love watching Dog Whisperer and I have used some of his methods, such as making Buster wait for me to enter/exit the house before he can come in. When I am outside with him, if I see another dog or a person I say "No Bark" and he will watch them closely but he will not bark. He is a very smart dog, I get lots of compliments on how well behaved he is. I have not really had any problems with training; he was pretty easy to housetrain and he learns tricks quickly." "This is our mini Chiwee Dexter. He is 9 months old in this picture and hates the snow. He was owned by another family and wasn't being taken care of properly, so my kids and I took him. Our Beagle dog of 12 years had died and Dexter came into our lives at a perfect time. He is such a sweet dog and my 3 kids give him lots and lots of love. Having some potty training issues, but with patience and a routine, it should all work out." 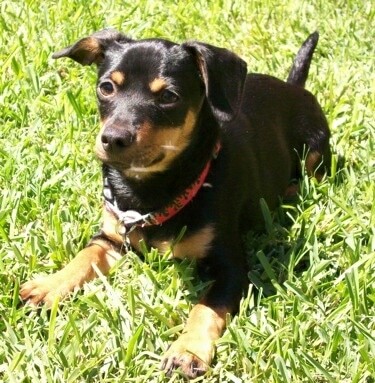 "This is our Chiweenie Sham Wow! (We just call him Sham.) We adopted him from a local animal shelter when he was about 10 weeks old. He had been taken from his original owner because that person had more animals than allowed by city ordinance. We realized that the shelter had rescued dozens of other small purebred dogs and puppies from that person’s house. Many of them were in very bad condition —covered in fleas, dirty and un-groomed, but in spite of the bad environment they had been living in, they were still friendly and social. About a week after we brought Sham home he became very sick, and we almost lost him. The shelter had given him a vaccination, but it was too late to prevent him from contracting distemper. The vet worked very hard to save him and help him get better, but for a few weeks we did not think he would make it. Sham is certainly a fighter—he recovered from the disease, but sadly, some of his littermates were not so lucky. The distemper also caused a permanent twitch in his left leg, so that he is constantly “bobbing” up and down when he stands. 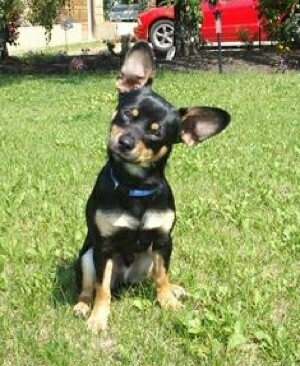 "He is now 10 months old, and he’s a rowdy, enthusiastic, and feisty little "teenage" dog! Other than the twitch in his leg, you would never know that he had been so terribly sick. 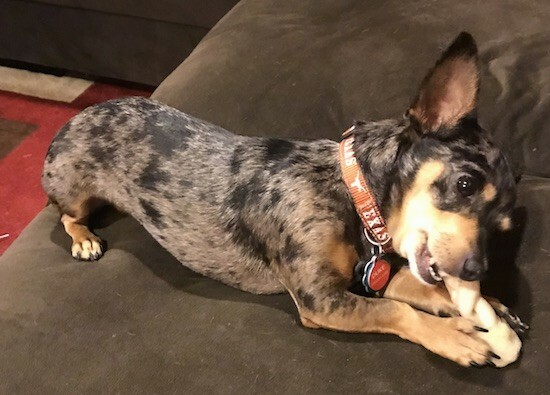 "Now that he is a healthy teenage Dachshund / Chihuahua mix, we are working diligently to make sure that he does not become the king of the house. We watch The Dog Whisperer all the time—Cesar's advice has worked wonders with our Beagle (and we all know how those Beagles can be! ), so now we're making sure that Sham grows up to be a "balanced dog" too. "I try to share Sham’s story as often as possible for two reasons. First, to help discourage people from buying from puppy mills or other disreputable breeders. I believe that his original owner may have been using all those small dogs for breeding and selling puppies. Obviously the owner could not properly care for all of them, and sadly, several of them died as a result of the disease and parasite infested environment. Secondly, to encourage people to get their dogs vaccinated—and to keep their vaccinations up-to-date! Canine Distemper is a horrific disease—dogs don’t usually survive, and they suffer unimaginable physical deterioration as the disease progresses. Please don’t risk losing your family’s loving companion—be sure to get them vaccinated!!" 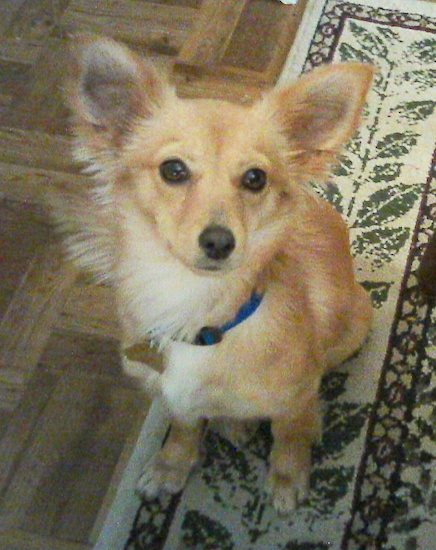 "This is our Chiweenie Taffy. She is half longhaired Dachshund and half Chihuahua. She is 1 year old, and is an animal shelter rescue. 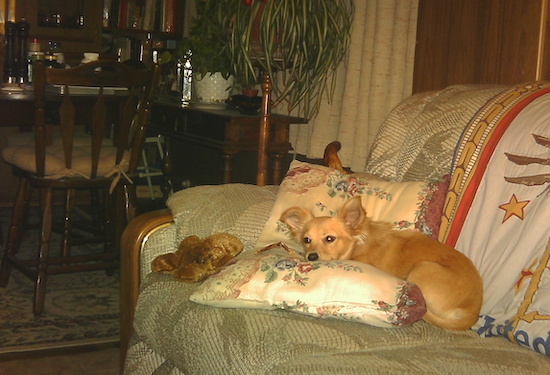 Taffy is calm, submissive, warm and loving. She is shy around new people, but rarely barks! She loves to sunbathe on our front porch, and sleeps right next to us as close as she can. She is relaxed but attentive. Really enjoys her daily walks with us. We have successfully used some of The Dog Whisperer's techniques to train her. She learns quickly. 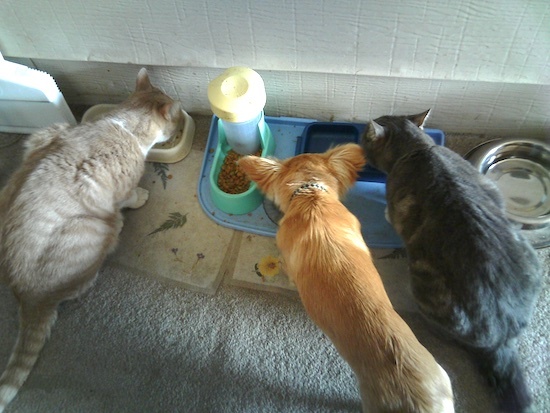 Gets along well with our 2 cats (who are bigger than her!). No maintenance is needed except an occasional washing. This dog is great!" 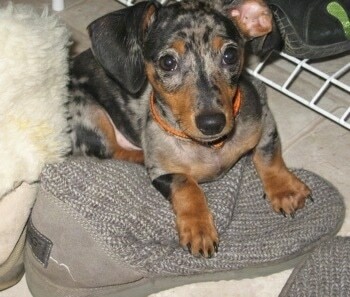 "This is my 1-year-old Chiweenie named Luigi Von Hunkledink Sabo. 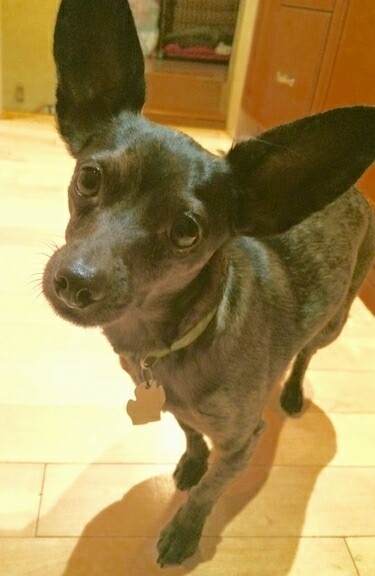 His mother was a Dachshund, father was a Toy Chihuahua. He is full grown, weighing only 6 lbs. He is very loyal and sweet. He makes the funniest growling and squeaky noises when he plays. He is extremely intelligent, already knowing how to sit, lie down, speak, beg, stand up. Knows what go outside, go bye-bye, and go on a walk means! I am extremely proud of him and love him with all of my heart! He is very sweet, and he loves to cuddle. I forgot to mention his ears!! They are almost as big as his whole body, and he likes to control them. He can make them stand alert, to the side (and he looks like batman) or straight back! They definitely make him one of a kind!" 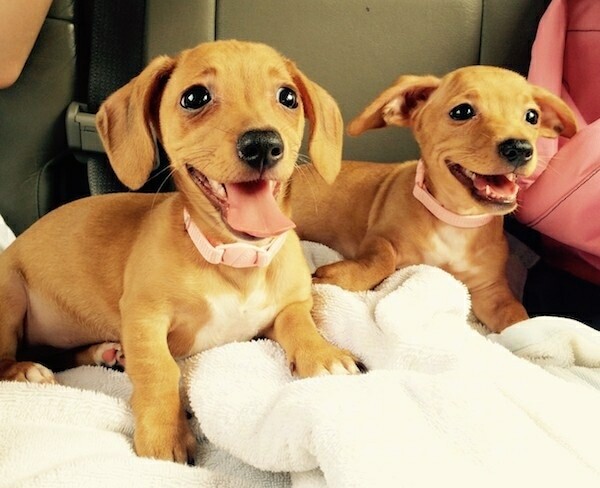 "Jager's dad is a purebred miniature Dachshund (he has the exact coloring) and his mom is a red Chiweenie (half mini Dachshund / half Chihuahua). "Jager is about 14 weeks old now. He is a very happy, wiggly little boy who aims to please. He loves attention—sometimes he will whine or bark for it, although he does not get attention when he does this. He gets lots of ‘good boy and ‘good Jager’ when he is quiet and behaving. He is learning ‘sit’ and ‘down,’ although I find him so excitable for the treat, it takes extra time and patience for him to calm down enough to do the trick. I am using clicker training, and he seems to respond well. He loves his ball—he can already play fetch! He caught on to that fairly quickly. I live in a condo, so I try to take him on at least two 10-15 minute walks a day, seeing as I don't have a yard for him. He follows at my heel so well, that he is usually off leash. "He is a beautiful coloring, and so small. One couple thought he was a ferret at first, and I have heard he looks like a rat or mouse more than once. Mostly, I have people ooohing and awwwing and telling me he is the cutest, tiniest thing they have seen. He is on the small side—I almost wish he wasn't going to grow much more."